Skiing is fun for the whole family! Three eager skiers having fun on the trails. The mission of the BKL is to introduce young people to the lifelong sport of cross-country skiing with all of its recreational, social, fitness, and competitive opportunities. 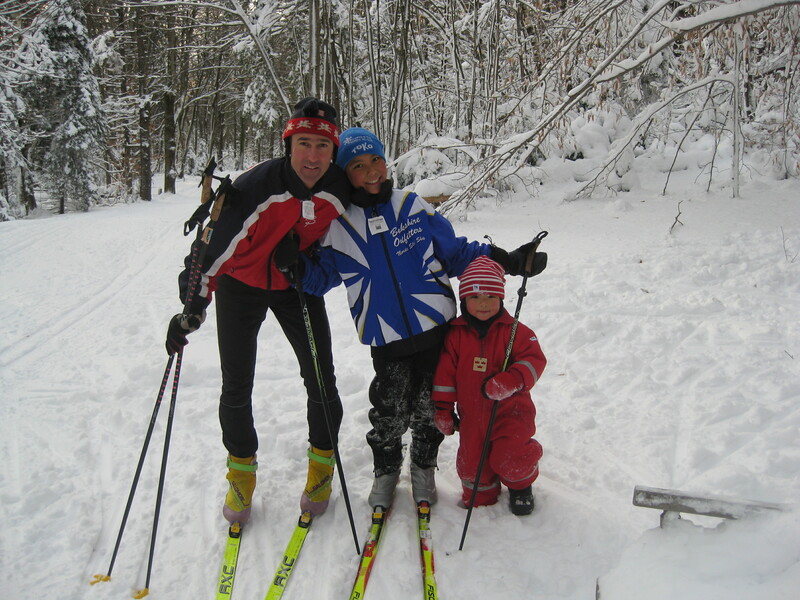 Our philosophy is that children should have the opportunity to have fun while learning to cross-country ski. 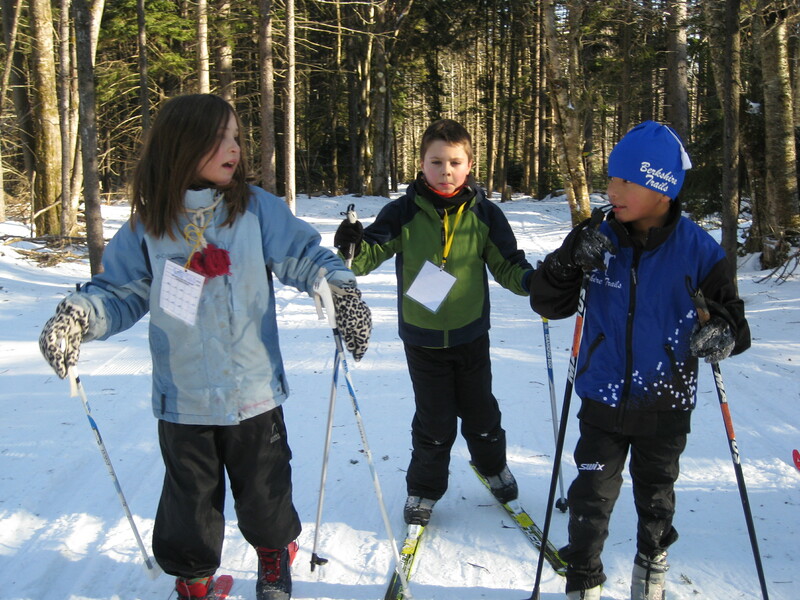 The Bill Koch Youth Ski League (BKYSL) is a cross-country ski program for children ages 5-14. The program provides a supportive environment for parents and children to enjoy the outdoors and learn to ski. Our emphasis is having fun on skis. The program is run completely by parent volunteers. Our club holds practices on Sunday afternoon, 1:30-3:30 p.m.
Our Season starts the first non-holiday Sunday in January and runs through the first weekend in March. Skiers are grouped by age and ability. Children in the five year old group and the 6 year old beginners are lollipoppers. Children in this age group need a parent/adult skiing with them. Our program is entirely run by parent volunteers. Each group has two main coaches with parents assisting during practice. Some of our coaches have had formal training but many have become avid skiers by learning along with their children. Do I have to attend every practice? We strongly encourage families to attend practices. This helps with continuity as additional skills are covered in each practice. As with any new activity, consistent practice helps your child progress more quickly. Especially with older beginners attending will help build their confidence so they can enjoy skiing with their peers more quickly. There is a racing component to our program, but children are under no pressure to race. Since all our children receive encouragement and support, no matter what skill or level, we often find that taking part in relays and races is enjoyed as a fun activity for the children and not a competitive, high-stake event. What do I need for equipment and where do I get it? We recommend that all skiers have proper equipment. An equipment basics sheet is posted on this website. Please look it over. If you still have questions, you can let us know and we will try to answer your questions. If you need to purchase equipment, we recommend a visit to Berkshire Outfitters in Adams, MA. Steve Blazejewski and his staff at Berkshire Outfitters are very knowledgeable and a great resource. In addition to a wide range of new equipment at competitive prices, Berkshire Outfitters also carries used equipment. Steve is always happy to help people figure out their children’s equipment needs. Please click on this link (cost of ski packages) to view the cost of ski packages for Bill Koch ski league skiers at Berkshire Outfitters. Also look for notices of various ski swaps where used equipment is often available. Instant Replay in Pittsfield sells used sports equipment and often has skis. It Takes a Village. Because we are a parent-run, volunteer organization we expect parents to volunteer during the season. We have a variety of jobs that you will have an opportunity to sign up for early in the year. You can sign up from anything to scooping ice cream to volunteering to assist in a class that needs a parent helper. Many jobs require very little commitment or skill; the most important thing is that we all volunteer for something. You’ll also find it’s a fun way to meet other parents in the club.